Our garage door company is an experienced contractor which also provides top quality gate services. “Garage Door Repair Mount Vernon” has extraordinary teams and that's one of the reasons that make our company unique. The other reason is our ability to offer both garage door and gate repair services. Don't let our name mislead you. We're definitely leaders in garage door services but we also have extraordinary experience with gates. So, we have organized our expert teams accordingly and keep things in order with the intention of continuing to serve our customers on time and with perfection. We have the right foundations to cover such extensive work and this is why we can assure you that our services will exceed your standards. It's difficult to make a list of every little thing we can do. The main thing is that our company is here for you. 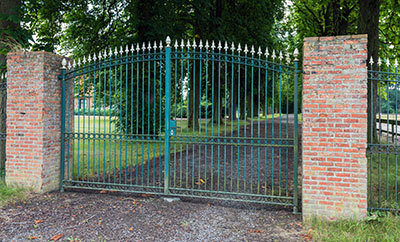 Whether you need gate installation or repairs, our technicians will be available. Whenever you just have questions, we are here to answer them. Every little advice or intervention by our technicians is good for your gate and perhaps it's time to get to know a few of the things we offer to our clients. Openers must be installed with precision and in accordance to the requirements of each gate system. Our technicians follow the specifications of the particular manufacturer and always the safety guidelines. This way, you can be sure that your new rolling or swing gate operator is installed perfectly and will work safely. Despite the fact that we service with excellence all types of gates, rolling ones are our specialty. We offer full repair services and fix any problem with their parts. We maintain them, replace broken components and troubleshoot them. If you need replacement, you can be sure that the service will be done properly. Each intercom system has special characteristics. They have many differences among them depending on their capacities and our technicians are knowledgeable of all of them and have the skills to both install and repair them. Whenever there are wiring issues, the image of the phone entry system is not clear or you have other problems, you can trust us for the services. When we replace the opener, we always program the gate clicker. If it loses contact with the operator, you can count on us to reprogram it. We replace rolling gate wheels as soon as possible. We get the right size ones and of the most durable materials. The service is performed with accuracy and at the convenience of the client. Anything wrong with the sensors will compromise your safety. We prevent entrapment by offering immediate services. Whether you have swing or rolling gate safety sensors, our services are equally fast and excellent. We replace sensors when their reverse mechanism doesn't work and we install new ones. The main thing is that new ones are installed with respect to all safety regulations. We have the pleasure to work with charismatic professionals in all levels. Apart from our good training and extensive knowledge, we're also dedicated and have the capacity to understand the requirements of all gates and their parts quickly. We have expertise and so the capacity to fix things and replace broken parts efficaciously. We're here every day for you and ready to take initiative whenever you're in need. Just contact our staff and let us know what we can do for you!